Scholars have seldom considered the native crop diversity in northwest Mexico and the U.S. Southwest as resources of the same cohesive ecological and cultural region. The term Aridoamerica is introduced to describe this overlooked center of plant domestication and diversification, which is distinct from centers of Mesoamerica and the Mississippi Valley. 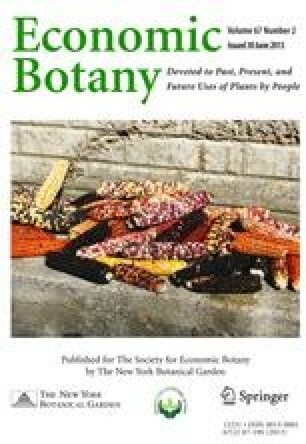 To understand why certain of its landraces are unique, the systematic relationships and gene-pool relations of crops found prehistorically and protohistorically in Aridoamerica are reviewed. Signifcant crop/ weed introgression continues where indigenous agriculture persists, but native fields are being rapidly abandoned or converted. In planning in situ and ex situ conservation efforts to maintain this diversity, both cultural factors and plant population genetics must be considered. Presented at the Symposium on Ethnobotany of the Greater Southwest at the Twenty-fifth Annual Meeting of the Society for Economic Botany, Texas A & M University, College Station, TX, 11–13 June 1984; symposium organized and chaired by Dr. Robert A. Bye, Jr.